Breakfast, lunch, and a nutritious snack are provided for children 12 months and older. 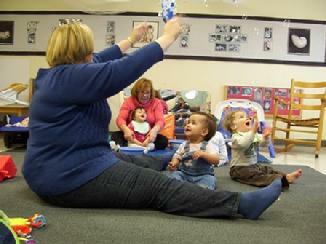 Infants experience many developmental changes in their physical, mental, language, and social development. They learn within the context of the relationships and environments provided by the adults in their lives. Our program for infants is designed to help them form secure attachments and to begin to develop relationships so they will grow into curious, confident, and able learners. Caregivers provide a safe, secure, and healthy environment for the children. They are aware of the sequence of developmental milestones and the age range in which the milestones usually occur and recognize each child as unique in his or her development. We use The Creative Curriculum® for Infants, Toddlers & Twos as a curriculum framework and guide. In this state of sensorimotor development, children learn through their senses and the exploration of their environment. We provide children with materials to enhance their development. They have space to crawl and walk; objects to grasp and squeeze; toys that make different sounds; books and music for listening and language acquisition. Most importantly, they receive warmth and affection by their caregivers to build a sense of trust and love. During the nice weather, the children have the opportunity to go outdoors. The infants have their own outdoor space adjacent to their room that enables them to benefit from fresh air and sunshine. To view WHSCDA, Inc.'s Infant Handbook, click here.